Goathland Garage Classics announce their 2 rider line up for this years Classic TT. 1993 TT winner Nick Jefferies and 2011 Manx GP newcomers B winner Gavin Lupton will be Manx Norton mounted for both the 350 and 500 races at this years event. With nearly a 30 year age gap between them, the two Yorkshiremen are eager to put on a good show for the team and hope to bring the bikes home in respectable finishing positions. 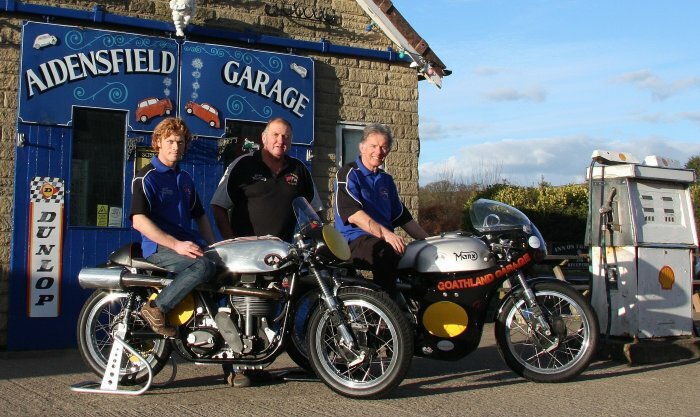 Bob Wood who owns Goathland Garage Classics, which is more commonly known as Aidensfield Garage from the long running TV series Heartbeat, has had many years experience in building Manx Nortons and is confident he can supply both his riders with good machinery for both races. "I was thrilled to bits when Bob approached me last September asking me to ride for him and felt we hit it off straight away. He is your typical straight talking, no nonsense Yorkshireman who says it as it is... I like that in a person. I couldn't ask for a better team mate either, I've known Nick for some time and we get on really well. He has even been a bit of a mentor to me during the last couple of years helping me learn the TT course, so I'm well chuffed." After making his comeback to racing on the TT course it will be Nick's 3rd year of competing in the Classic TT that's rapidly increasing in popularity. So with 87 race starts of TT course under his belt along with 67 replicas, he certainly knows every inch of the mountain course and hopes to use his vast experience to push for a good result. "I have to say, I'm very privileged to be riding Bob's well turned out machines and having past experience on Manx Nortons, I'm looking forward to taking these round the TT course. It will also rekindle my love for single cylinder racing around there, something I enjoyed when the singles class was part of the TT in the 90's."